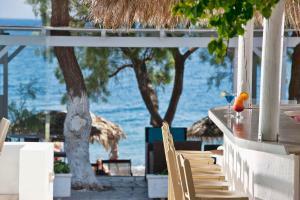 This charming hotel is located on the beach of Kamari, one of the well-known black gravel beaches of Santorini. 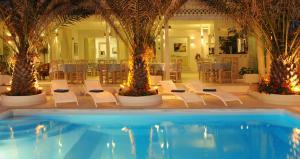 It offers elegant rooms with a furnished veranda overlooking the black sand beach of Kamari, the gardens or the pool. 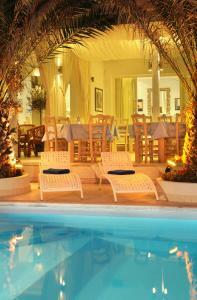 Elegant room with 1 bedroom, bathroom with shower and private veranda overlooking the garden. Please note that additional guests can not be accommodated in this room type. This superior room includes a 1 bedroom, a living area, a bathroom with a shower and a veranda with garden views. In this room you can stay 1 additional person (see hotel's conditions). This superior room includes a 1 bedroom, a living area, a bathroom with a shower and a private veranda with sea views. This room has a shared pool with sun loungers and a seating area. Rooms of this type do not admit additional guests.